I was so ready to get out of town…the heat was starting to get really intense. 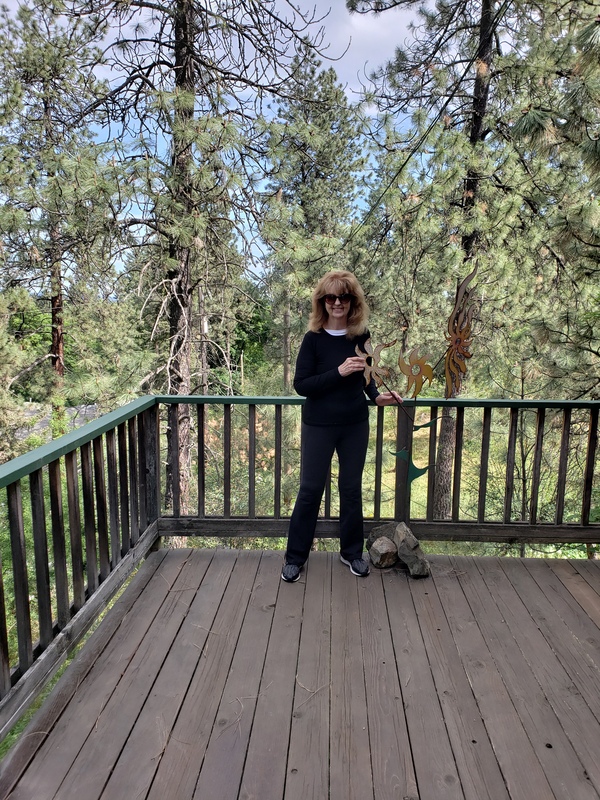 I left home before noon and made it through to the Phoenix airport, changed planes and went on to Spokane, arriving with no blasted-out windows or oxygen masks dropping down! At 5:30, Lee was patiently waiting in the baggage area and we were out of there in a snap. 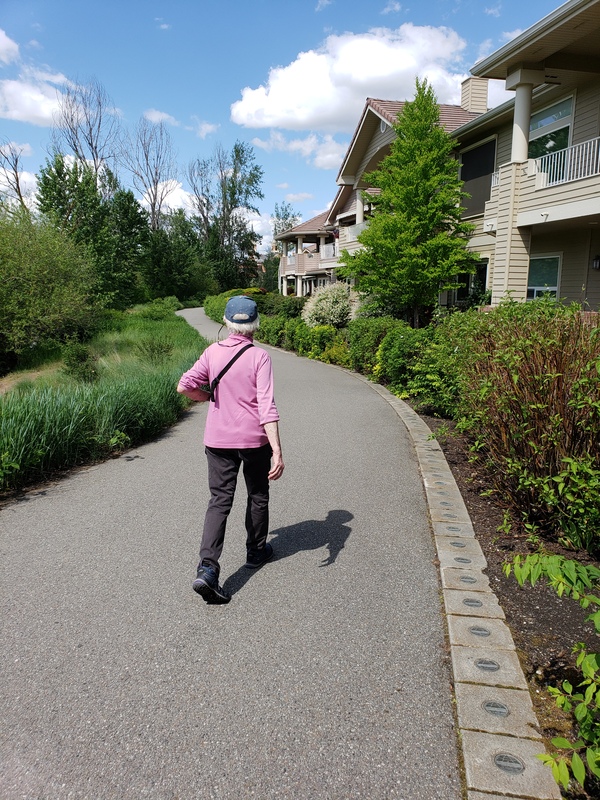 The afternoon was beautiful …we scooted home to have a drink out on the deck of her house overlooking the gorgeous firs and pines lining the gully of her back yard. After which, we had dinner, a long talk, and so to bed. 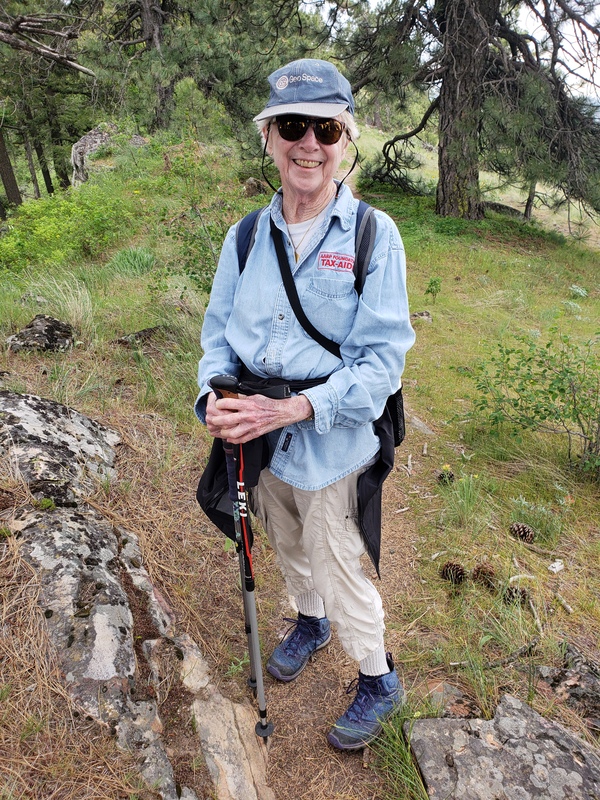 Lee had researched some new trails in readiness for our visit, and on Wednesday morning, we were up with the larks as it were. 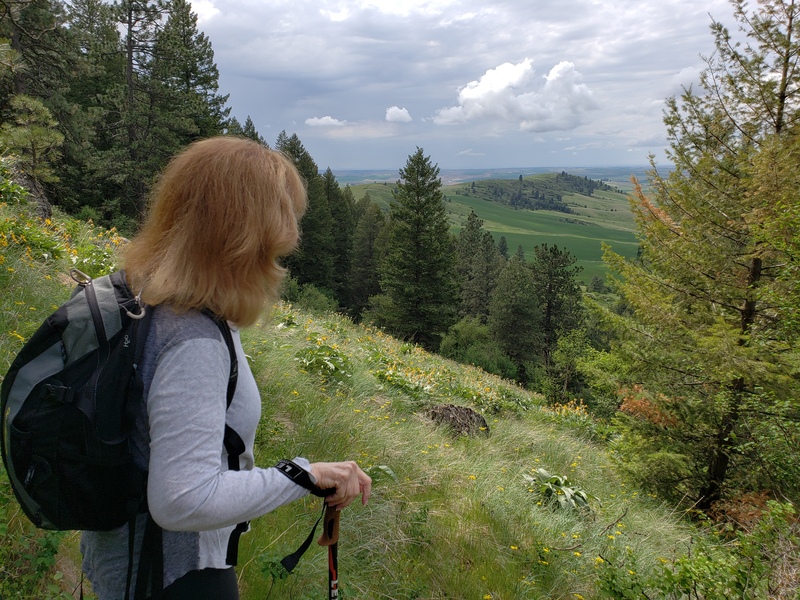 The weather was beautiful, and we were in the car by 9am, on the road to Kamiak Butte, where we intended to hike to the crest. 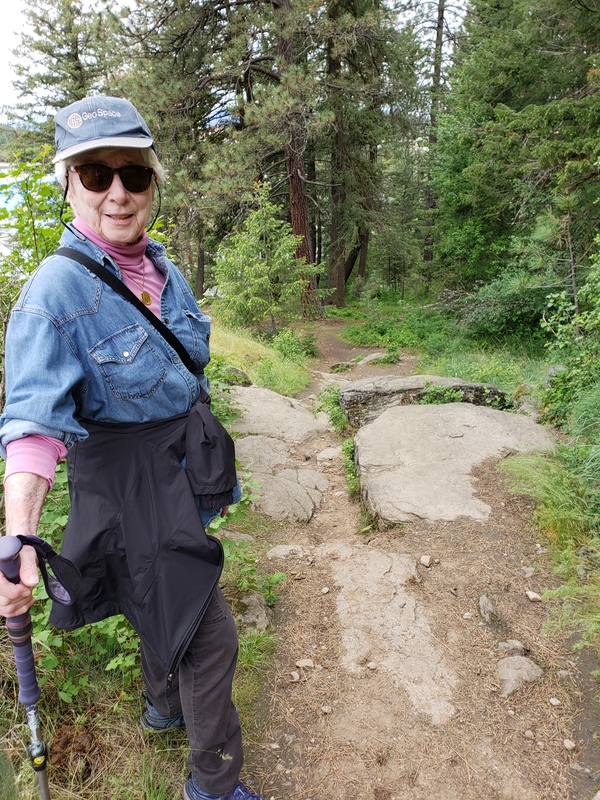 This was a challenging hike for me – not so much for Lee, as she hikes around Spokane all year long! 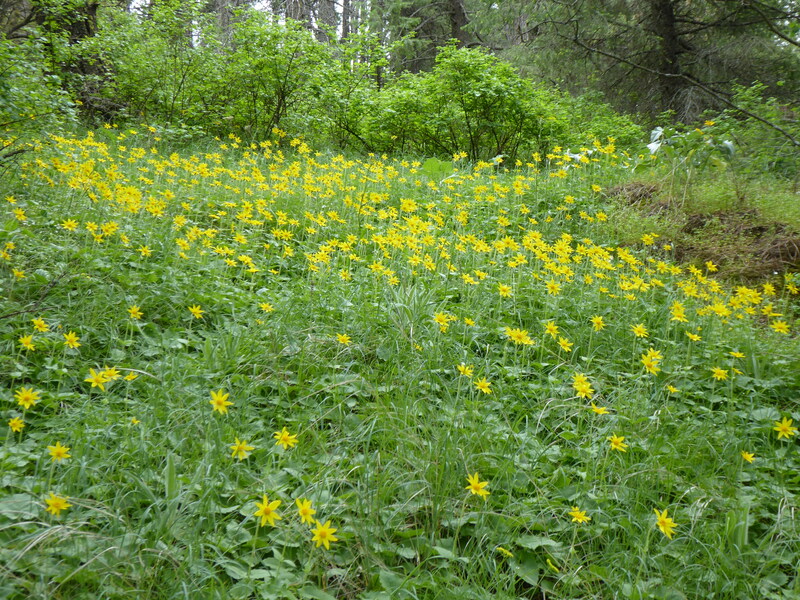 The hike itself is purported to be 3.5 miles – 1,000+ feet. 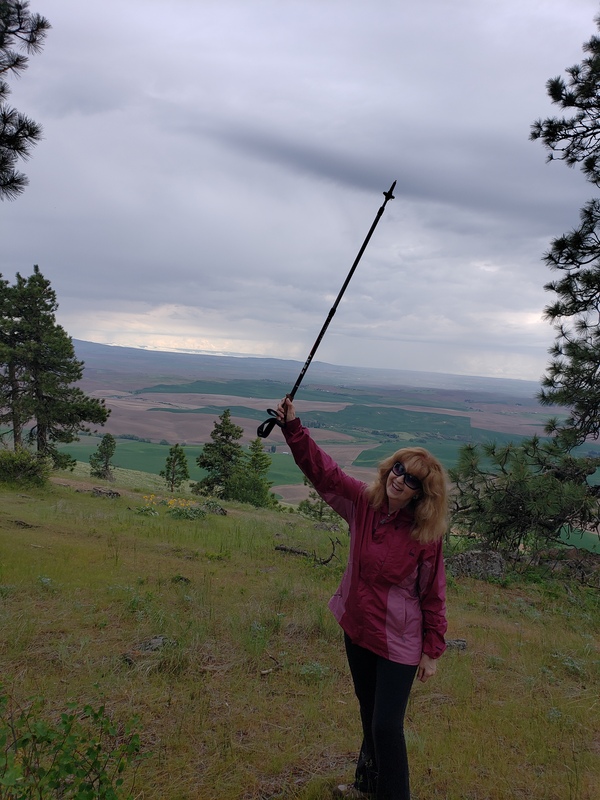 Unfortunately, I could not for the life of me get one of my hiking poles to screw to the proper height and hold. So I left that one behind, depending on the other pole to see me through when necessary. 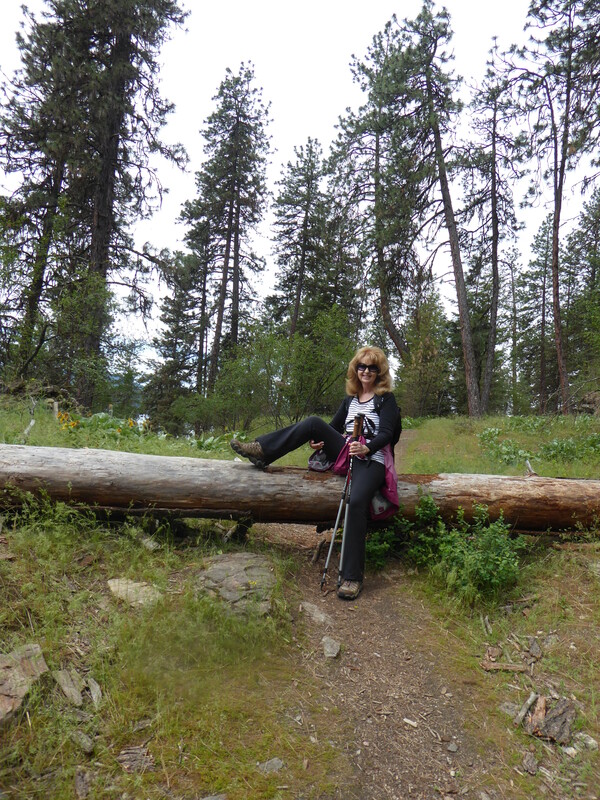 I really prefer two poles for balance – and once upon a time in the far distant past – I didn’t even use poles! 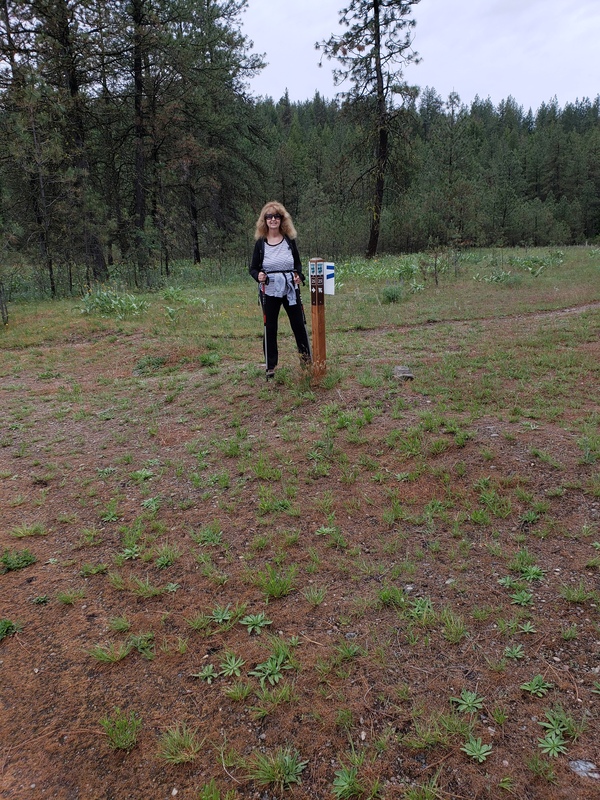 The trail was, of course, mostly uphill although there were some flat footpaths as we wended our way round the butte. Boy, could I tell that I hadn’t hiked in 2-3 years! Not only that, I could feel myself listing to the right, with the one pole holding me up! 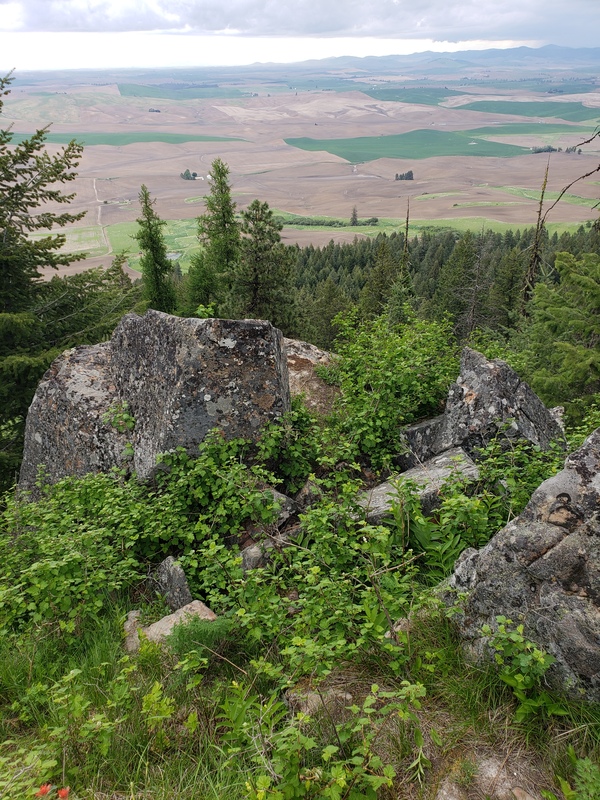 Initially, the trails were ferny and lichen-lined, but as we ascended, they became rocky and bouldery-y – and steep. 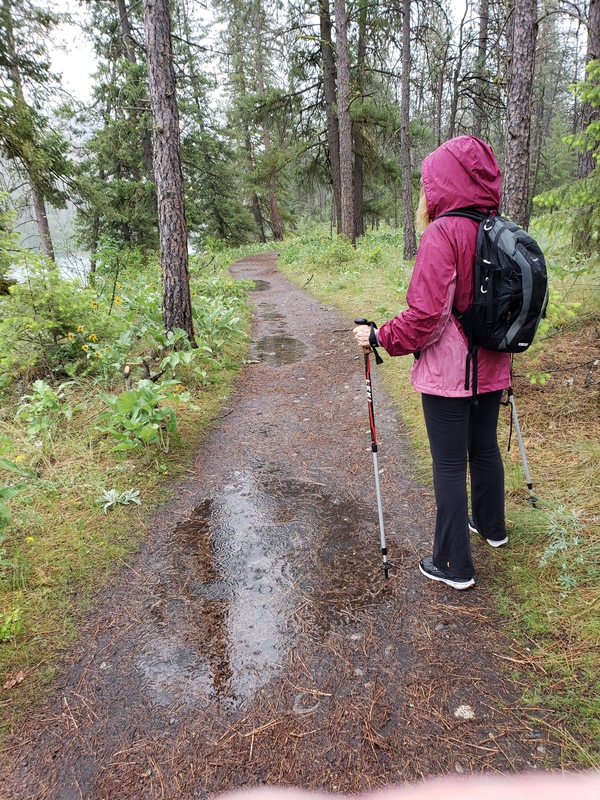 In the distance, we heard intermittent thunder, and a few raindrops hit our faces, but it still remained fairly light and bright, so we soldiered on. Just like in the movies, we kept thinking – where’s the top of this place! Halfway up, we stopped for “a little smack of something” to keep us going, and then it was back on the trail. By this time, the thunder was closer, and the gentle rain from heaven was definitely splattering on the place beneath. 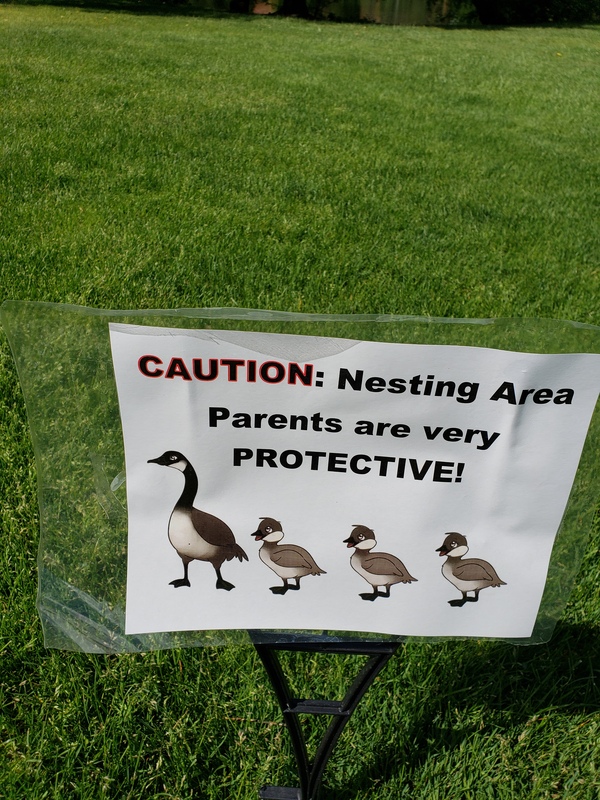 (Well, not heavily – just splats!) But we got to the top where we’d planned to finish our picnic sandwiches and have a brief rest. It was not to be. The sky had turned heavy, and we thought we’d better get downhill and back to the car before the rain really increased in volume. 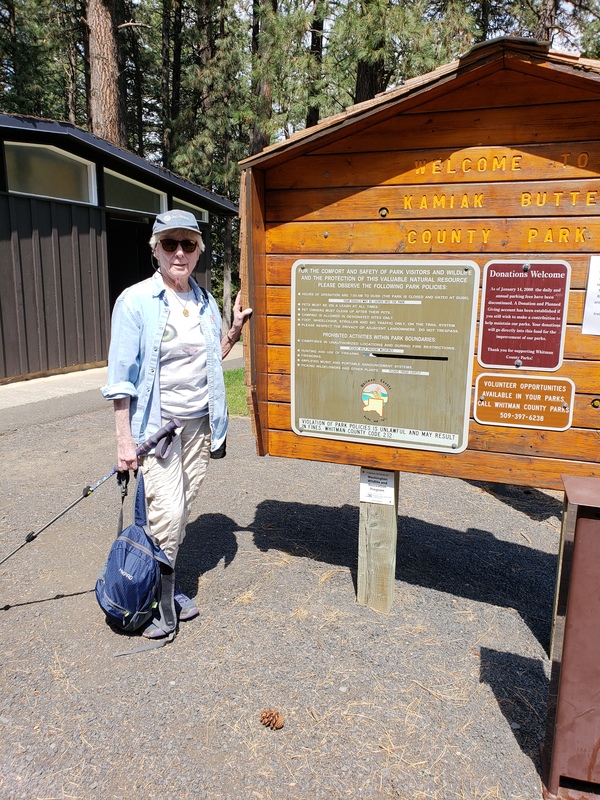 So back on the trail – getting about 3/4 of the way down and paying attention – so we thought – to signs and arrows showing which way was what. We came to a sign which said “Private Property” and more or less, “Enter at your peril” (ha!) but we ignored the sign, as we have always intelligently done in the past. Down and down we went until what had started as a fairly gentle trail gave way to high grasses and NO trail. 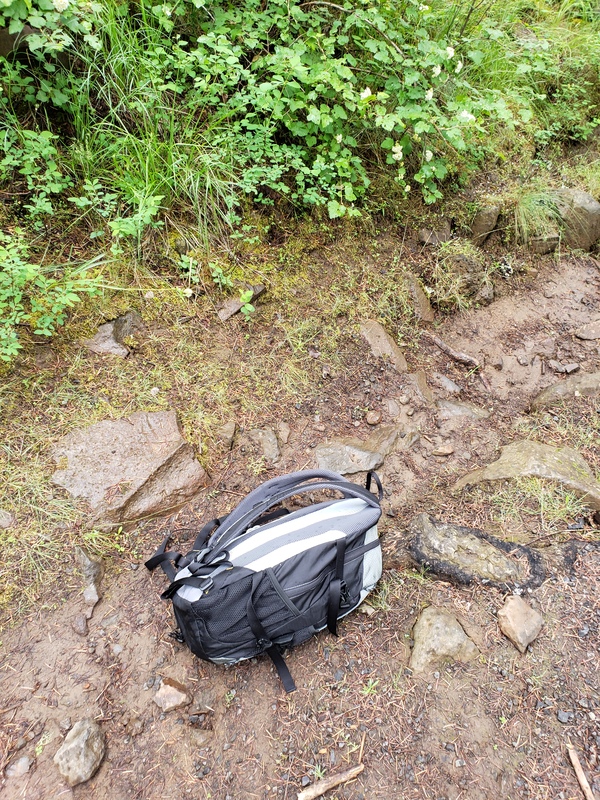 We kept hoping we’d find a footpath…breadcrumbs…something…but after half an hour – during which I had to stop, take off my hiking shoes and replace with my walking shoes, which I’d brilliantly stuck in my backpack – we knew we were going the wrong way…and we were tired. Lee took the moment to have a brief rest…. 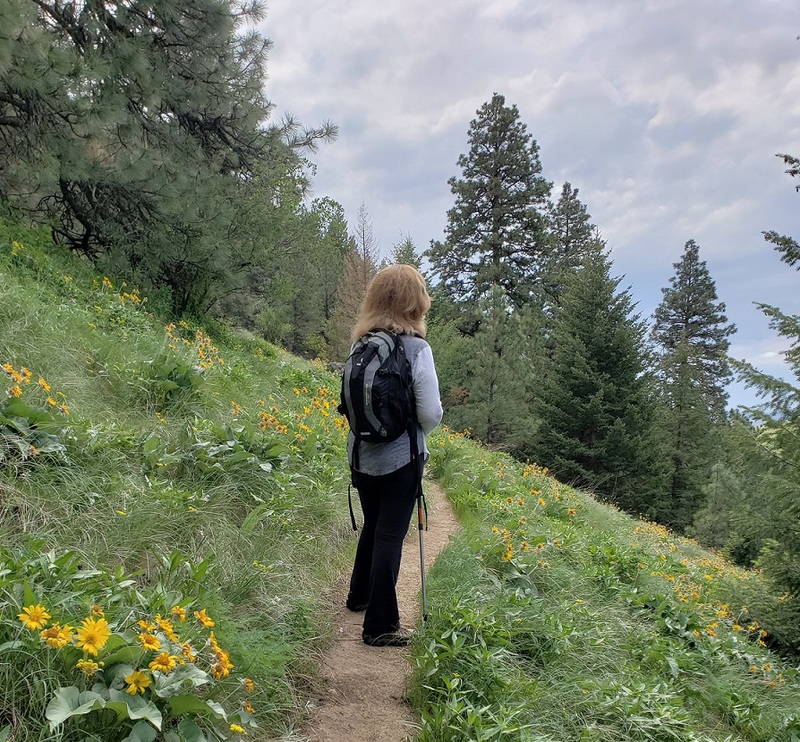 Nonetheless, we turned back UP the hill, and Lee providentially noticed a trail (which we had apparently overlooked before) which proved to be “the right track.” All in all we hiked for about 5 hours – about 5 miles total. The weather by this time had given up the ghost on the sunlight and was dim and wet. My hair looked, as it does in these instances, like a brillo pad – but luckily for me, I can erase those images from the cell phone camera. Ha! 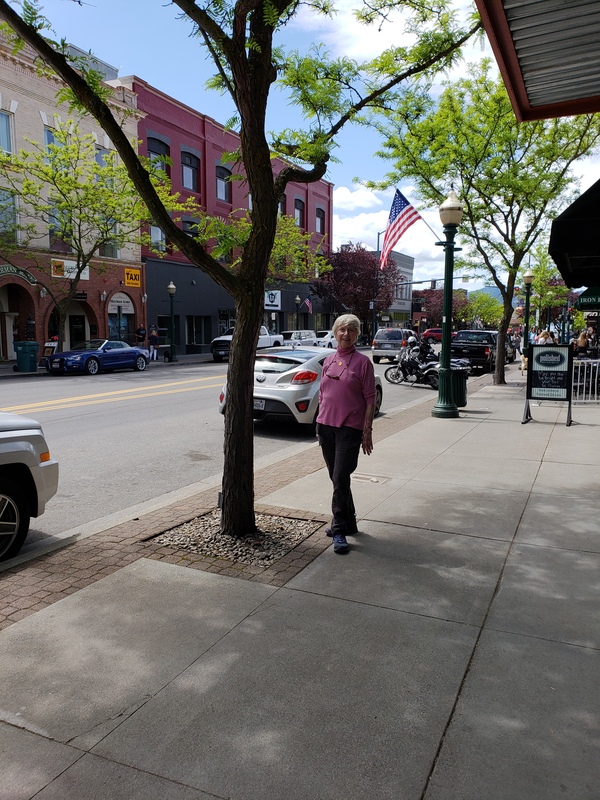 We got in the car and drove to a small café called South Hill Bistro that was absolutely delightful…ending up in a cozy booth with an IPA beer for me and a martini, then wine, for Lee! I had fish and chips, and Lee a beef salad. All was yummy. 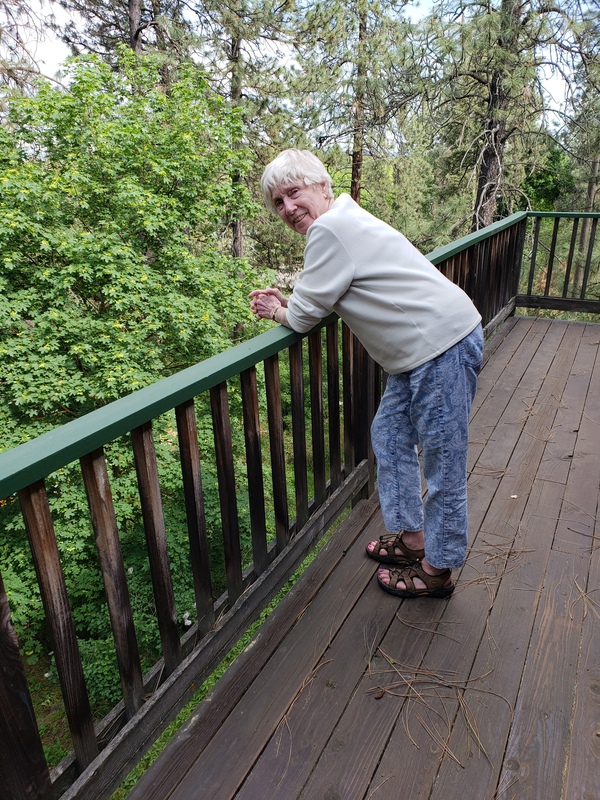 Then it was back home at twilight, to sit on the deck and pontificate for an hour…and then as we were both exhausted…we called it a night. Slept late today (well, 7:30) and woofed around reading emails and the news, while Lee ran to the grocery store for some essentials of life, including of course Guinness… The rain had started in earnest by the time we were on the road; nonetheless, we decided to go to Riverside State Park, at the Bowl and Pitcher (a starting point for the river hike). We got there while all was still relatively dry, and then took a few minutes trying to get my “other” pole to work – which – ta da! – I finally did. 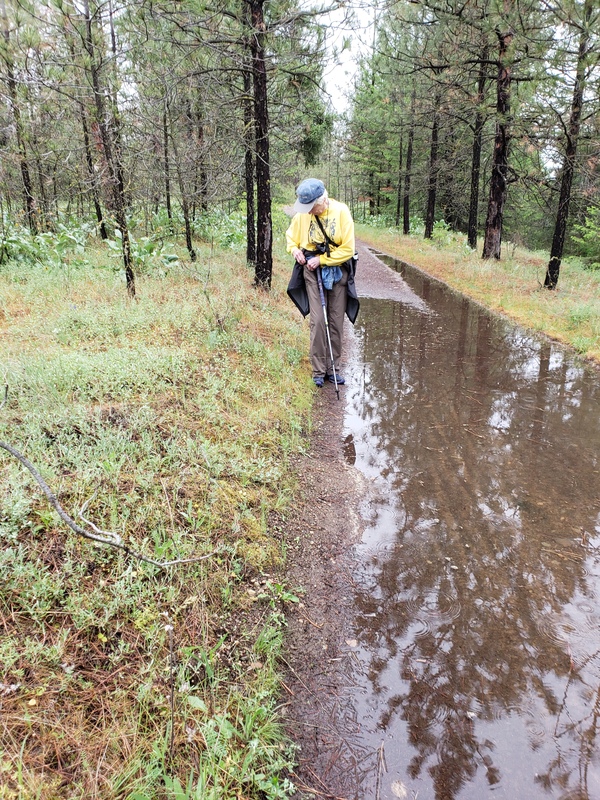 Off we went through the puddles, like ducks. The river was in spate, and very high, lots of white water – rushing beneath the bridge we crossed and giving me a moment of vertigo when I looked at it through the bridge slats. 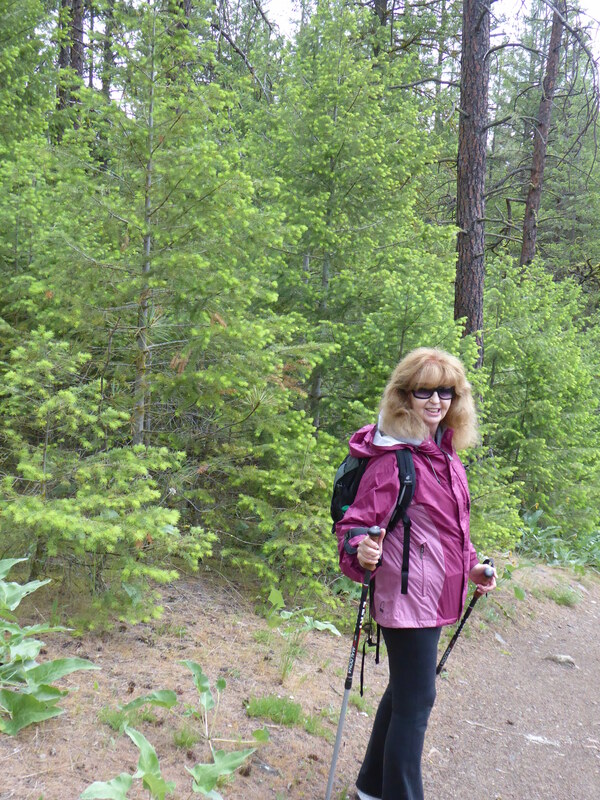 The trail itself was fairly benign, flat and few rocks or boulders. As we walked on, it began to rain more heavily, so it was on with the raincoats, and pulling our hoods over our heads. At which point, I looked like Bilbo. 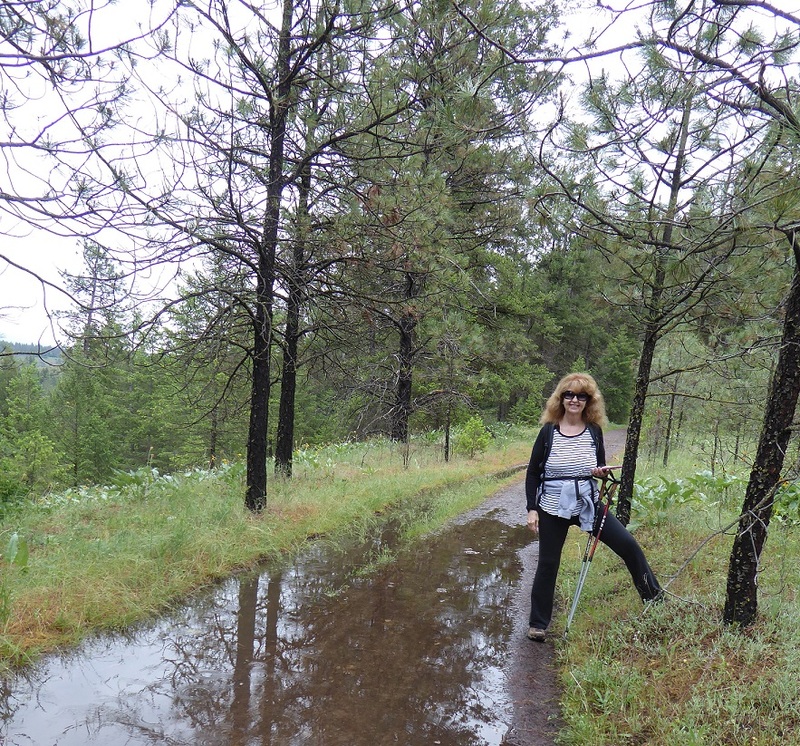 The trail began to gather more puddles…and the mosquitoes were everywhere. Eventually, two hours later, we gave up the ghost and wended our way back to the car. We did manage a few photographs, but between having problems with my new phone camera and the wet weather, we decided enough was enough! 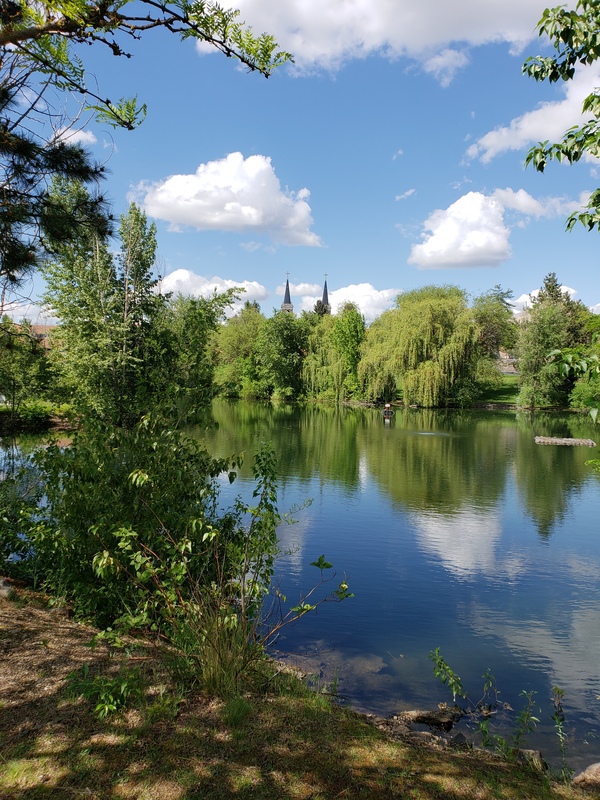 So it was home to strip off our wet clothes, dry off, eat our picnic sandwiches in the living room, and then take a short ramble around the neighborhood, whose streets were lined with the most interesting, eclectic homes…and beautiful landscaping. And wild turkeys! 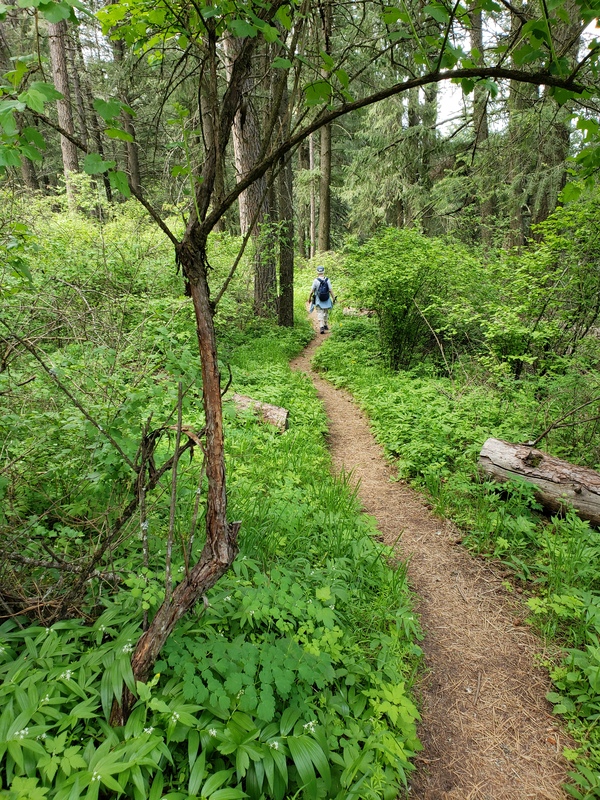 Managed to peel myself out of bed around 7am… puttered around for a little, reading emails and checking news stories, then upstairs for breakfast and coffee… After a quick shower, I packed my backpack – Lee is always aghast at the weight of it – and by 10am, we were off to the Old Trail Road trailhead, known as Trail 25. It was chilly and damp, having just finished raining. But the sky looked to be clearing, so off we took. 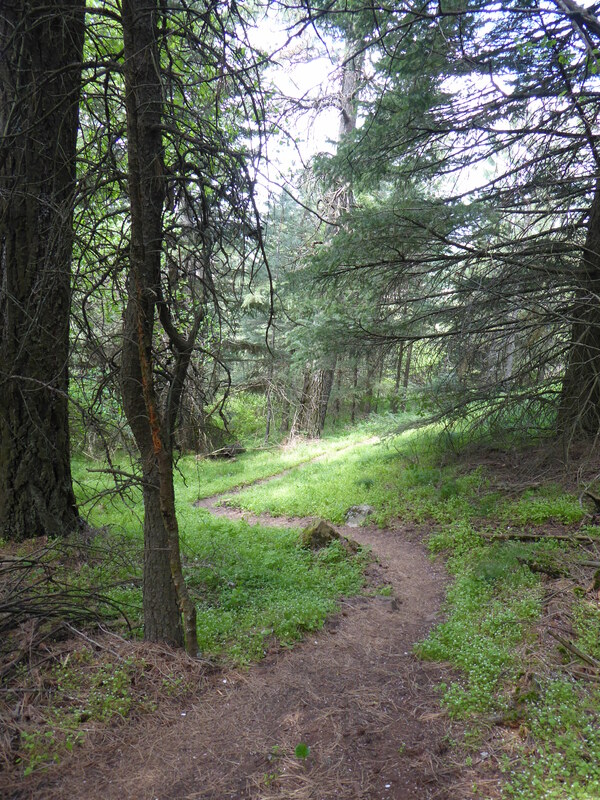 The trail was a nice easy walk for the most part…wide, bordered by firs and pines, and pretty flat. 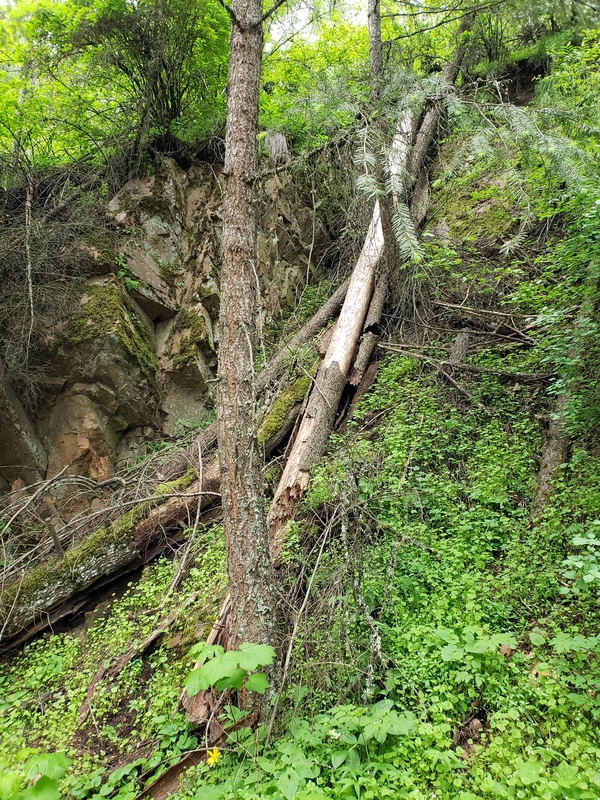 As we entered a more forest-y area, it started spitting raindrops, and the trail narrowed and began to roll up and downhill, with some rocky terrain. I was glad of my two poles!! 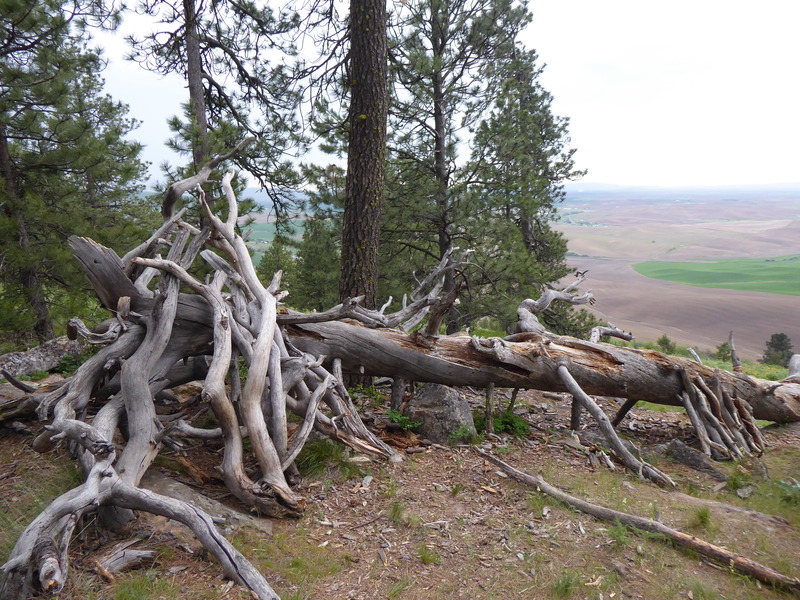 The trees grew closer together, some overhanging the trail. 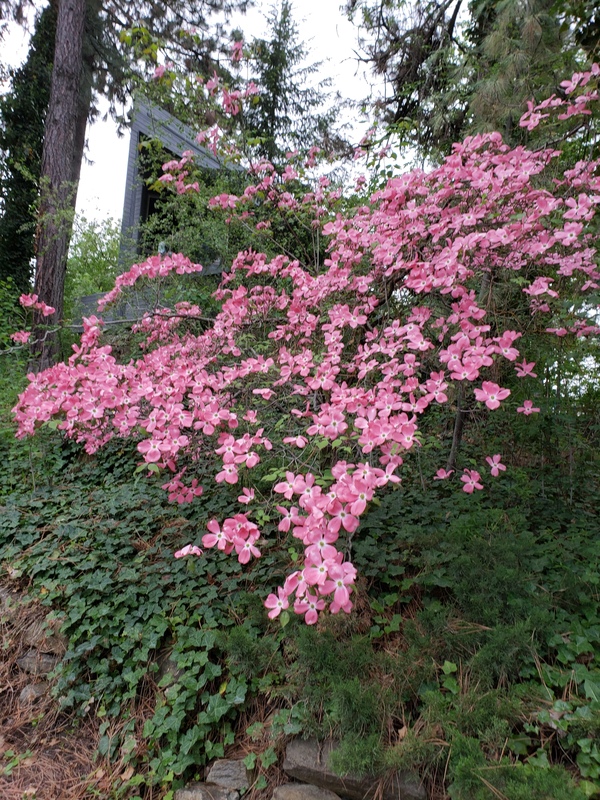 Hills covered with trees, foliage and flowers soared on one side, while the other dropped off gently to lots of scrub and foliage. 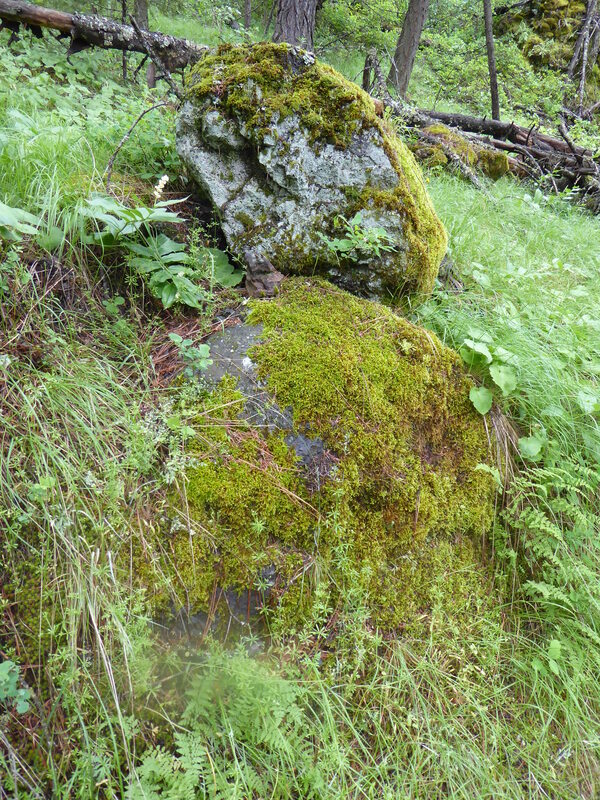 Beautiful sage-green moss grew on the boulders, but many of the flowers had already seen their springtime and were not in abundance. 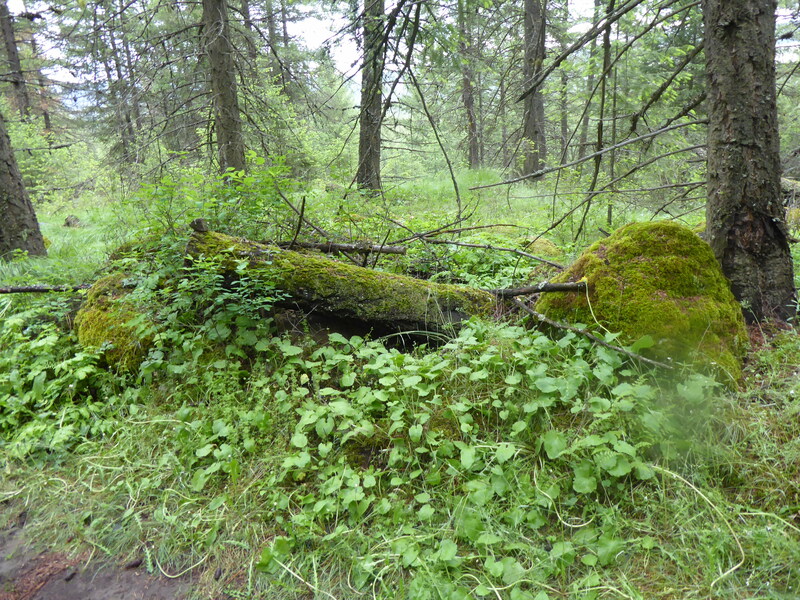 We hiked for about an hour, then the mosquitoes got to be too much, so we turned to come back. The day had started off fairly cool, and now was somewhat warmer, but not by much. But it was muggy as all get out! Nonetheless, I didn’t need a hoodie – too hot! Lee and I matched hiking strides, and we had all in all a good 2 hour hike through some very lovely countryside. Unfortunately, Lee had forgotten her backpack with food therein! So we wended our way home, found the backpack with the sandwiches, and had a nice 30 minutes of eating and yakking it up. And here comes the sun! 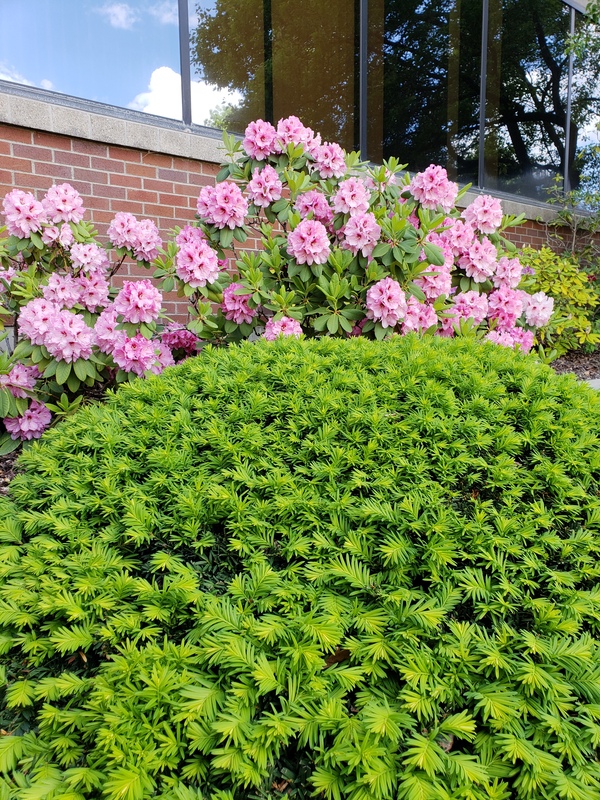 It was a complete volte face weather-wise today – the sun came out and stayed out, and the day was absolutely beautiful…and warm. 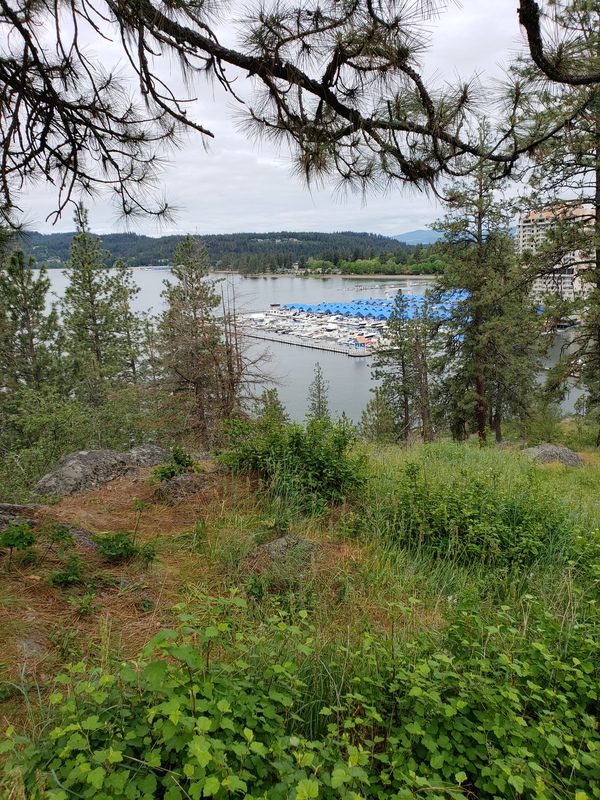 The trail, while not terrifically difficult, was nonetheless uphill and rocky…it circled Lake Coeur d’Alene, giving us misty views of far-off mountains, fir and pine forests, and beautiful blue clear water. 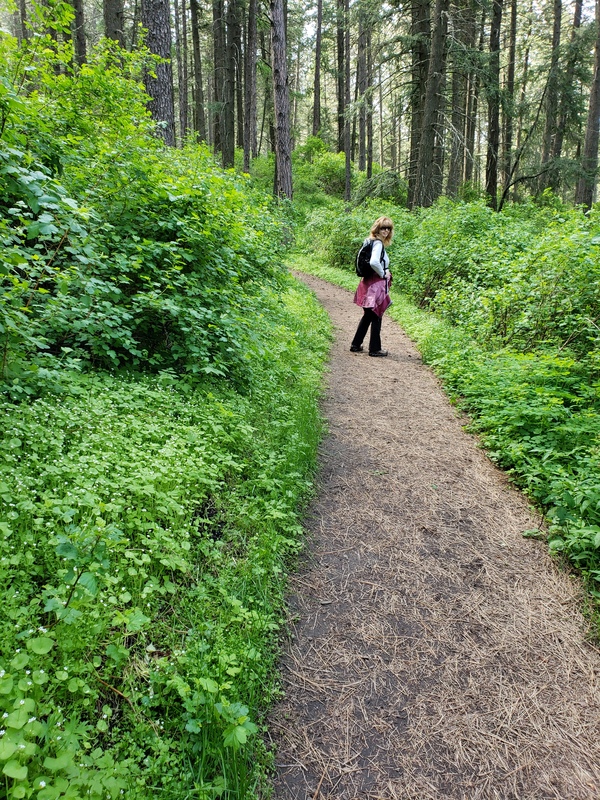 The trail itself for the most part was paved in pine needles, so soft underfoot. 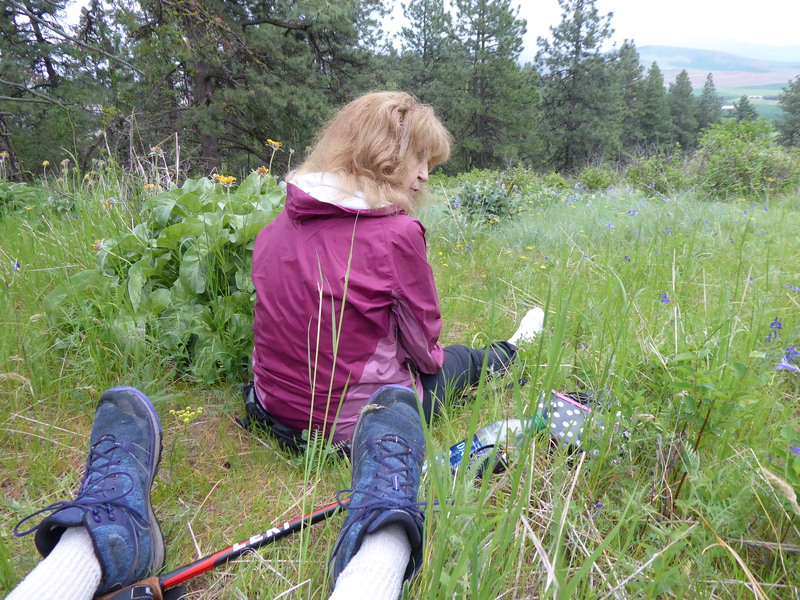 My hiking boots were holding up really well…and I also had my twin poles for balance, so I was good to go. Lee kept to a single pole, and beavered up the mountain toot sweet! The sun shone through the pines, and the scented air smelled of pine resin. 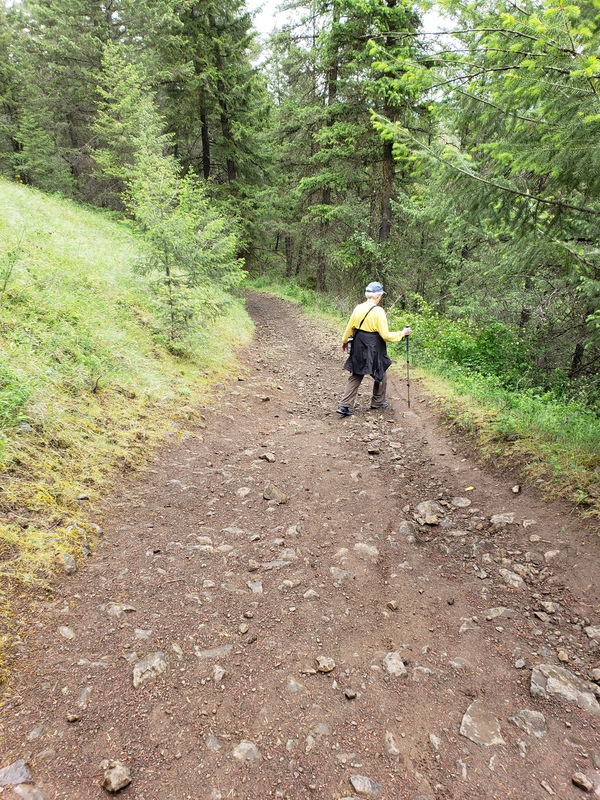 Of course, halfway around the lake, we managed to get “sort of lost”…no matter which trail we took it ended in deadlock. So finally, after an hour, we turned back hence the way we came. What the hey…it was still beautiful!! 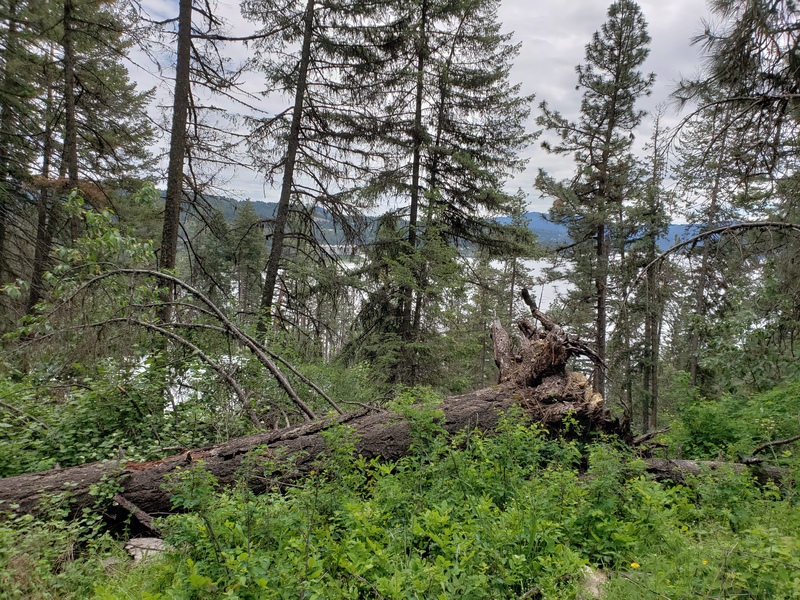 Basically, we walked an hour and a half…about 3 miles all in all, over rocky boulders, fallen trees and tree roots, all the while keeping the lake in view. Back in the car, after some discussion as to whether or not to hike the Mineral Ridge – somehow the fact that “ridge” was part of the name gave us pause…we ended up driving back to Spokane, and walking around downtown for an hour and a half. 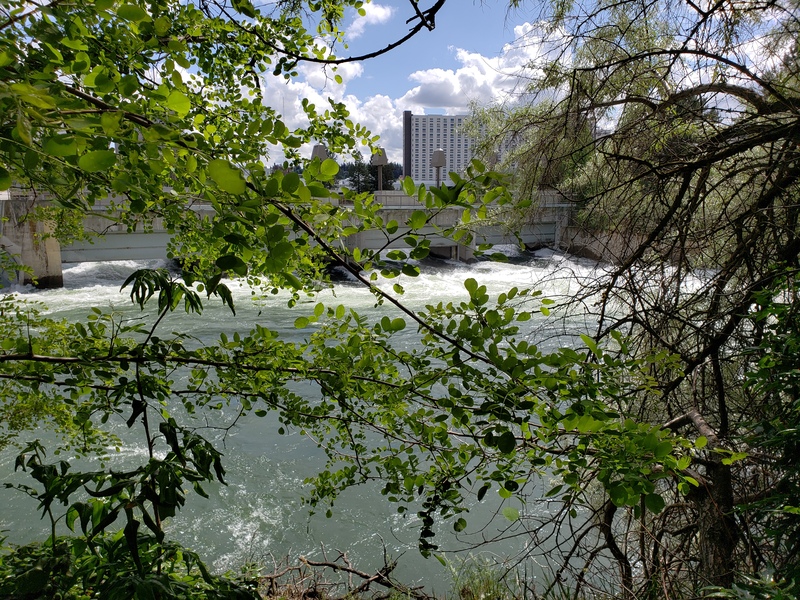 Spokane is just a beautiful town….the architecture is crisp and clean, everything looks as if it’s been scrubbed once a day. 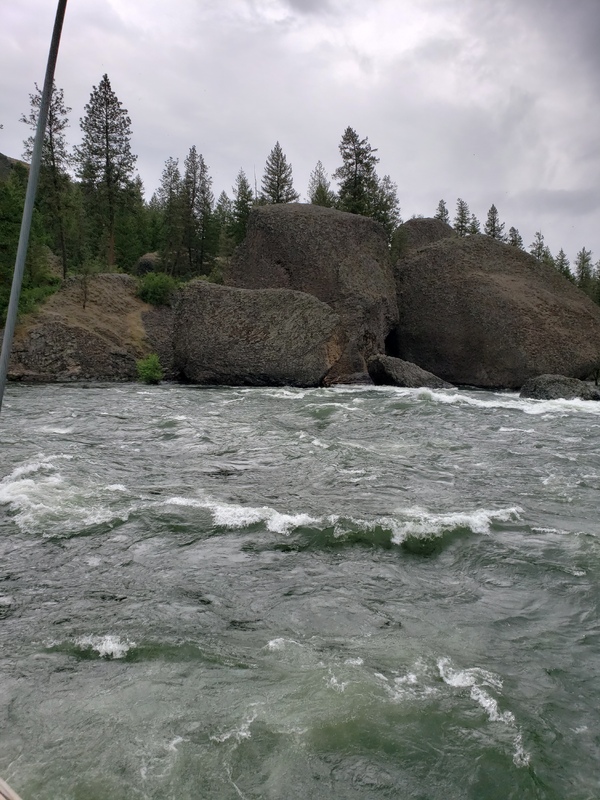 We walked the Spokane River pathway … the river was in full spate, and made a terrific noise under bridges, with whitewater horses jostling and sending up white sprays of foam. 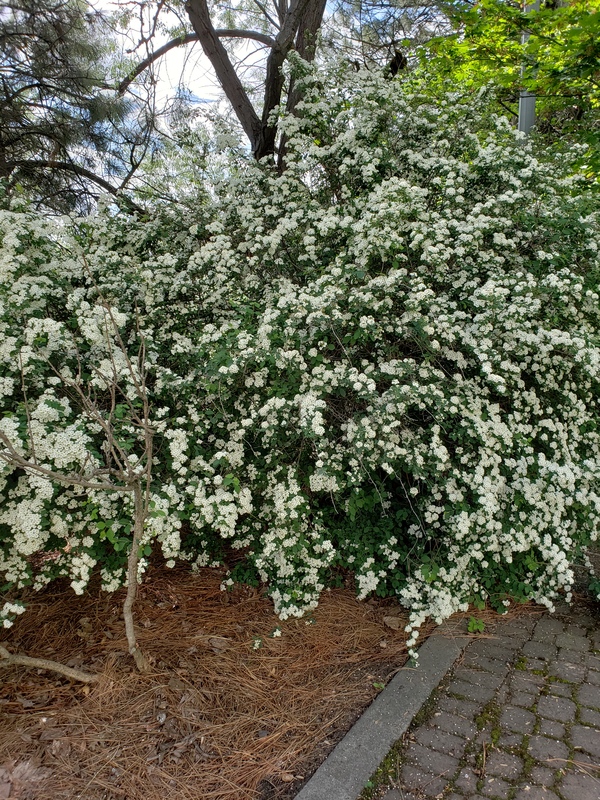 The landscape was green green green – dotted with white and purple lilacs, purple iris, white spirea, rhododendrons, and other gorgeous flowers in full blossom. The sky was very blue, the clouds very white. Townhouses built along the river were painted sage green, blending in beautifully with the landscape, and the architecture was pristine. 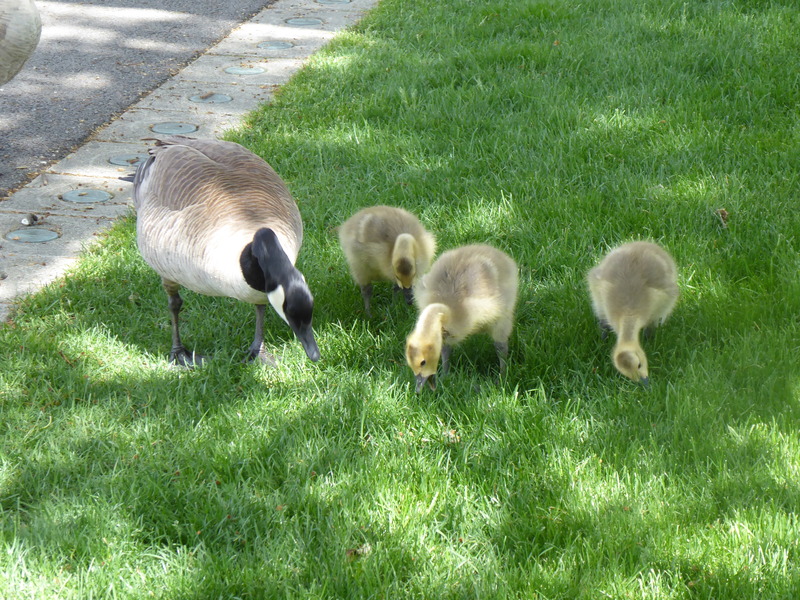 The river is home to all sorts and conditions of wildlife, and halfway around the river, goslings and their mother crossed our path…or, their path. Nice to be able to live there! I loved it. A beautiful walk. A beautiful day. After which (6 miles altogether all day), we decided to weave our way home, have a minute’s rest, and then drive back downtown for dinner at Twigs, a charming restaurant close to the river. 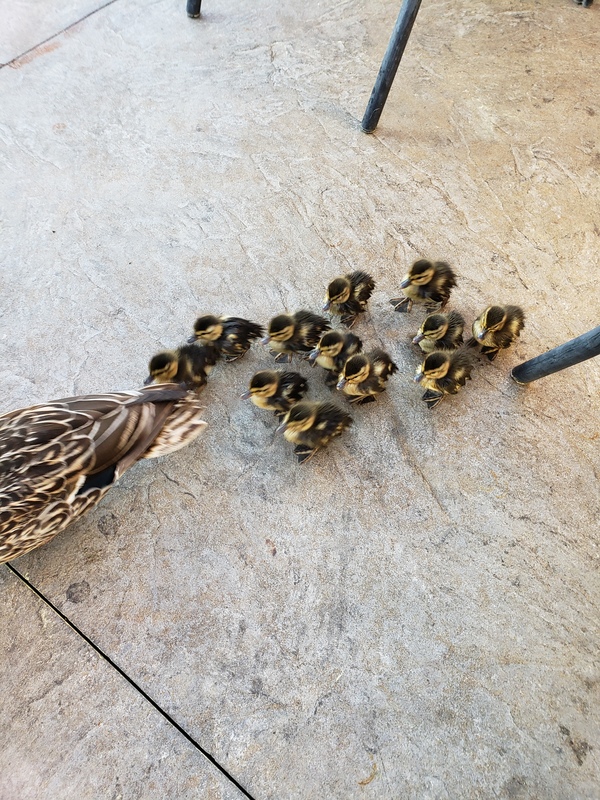 We sat on the patio in the late afternoon sunshine, sipping and just kicking back…this time a little group of ducklings and their mom joined the merry throng on the patio…they pattered around, duck-nibbling this and that, and finally found their way to grass and river. Perfect! I’ll miss being able to step outside and almost immediately be part of the green of nature… Of course, this is the joy of travel…you get to be where you want to be, while keeping in touch with friends who feel the same as you do…So here’s to another delightful trip and visit with Lee, and the pleasure of seeing and hiking yet more of the beautiful Spokane countryside! 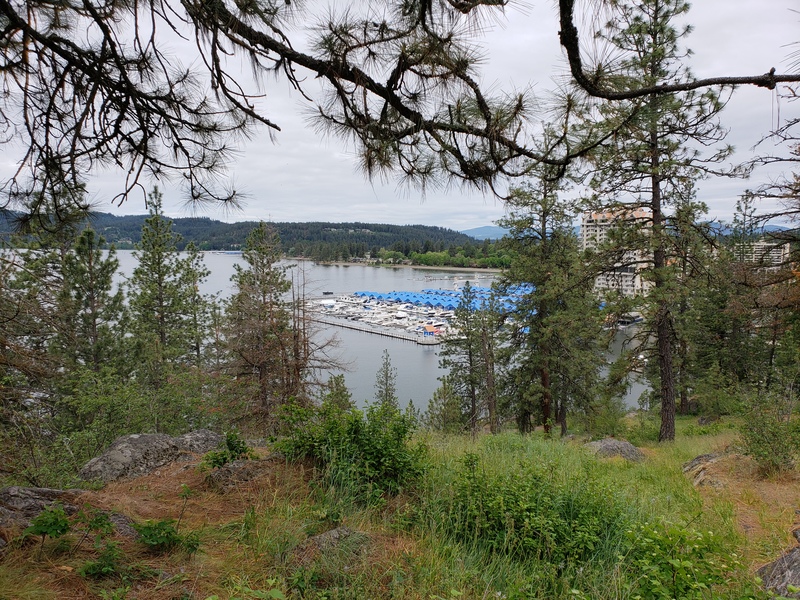 Posted in Uncategorized and tagged Bilbo, Coeur d'Alene, Dockside Restaurant, farmland, fir-lined trails, firs, from Spokane to Coeur d'Alene - the beauty of the hike, Kamiak Butte, Lake Coeur d'Alene, lichen, moss, Old Trail Road trailhead, pines, rivers and lakes, Riverside State Park, Spokane, Spokane River, Trail 25, Tubbs Hill. Bookmark the permalink. Well I loved it. 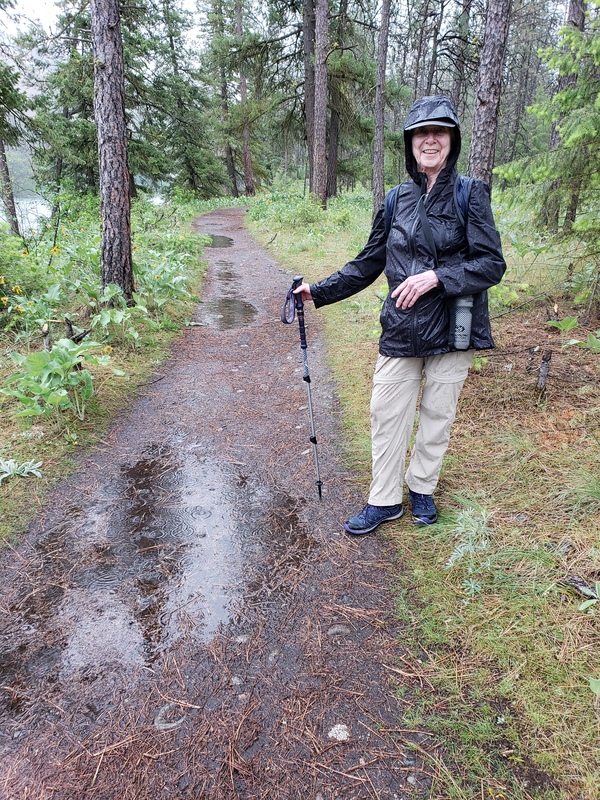 Fabulous pictures and such wonderful hikes … rain and all!